Your Federal Taxpayer Receipt is a new tool that shows you where your tax dollars are being spent. Interested in finding out how your hard-earned tax dollars are spent? Now taxpayers can with the new "Your Federal Taxpayer Receipt" tool that The White House launched on April 15, 2011. 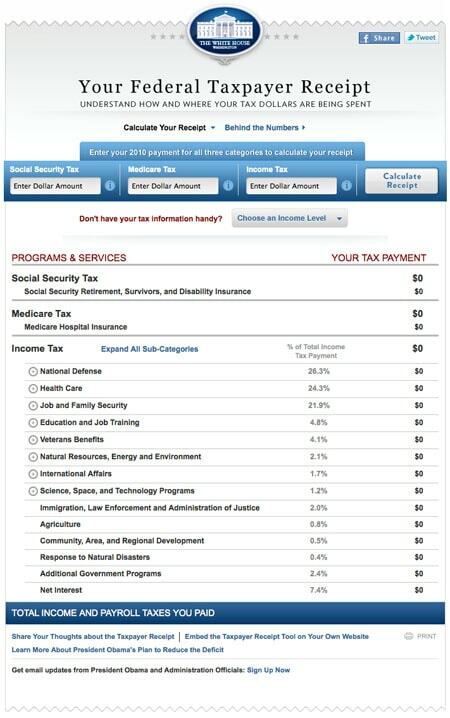 Simply enter a few details about your taxes and you'll get a "receipt" that shows you how many of your tax dollars have been paid into various programs and services like national defense, health care, veterans' benefits, space, science and technology, and education. You can expand each of these areas to see more-detailed breakdowns by category. It's okay if you don't have your tax information handy. The Taxpayer Receipt allows you to choose from several income levels that can estimate this information for you. If you're interested in getting a peek into how the numbers in your receipt are calculated, a Behind the Numbers link lets you see the percentages of overall spending across federal programs and services for Fiscal Year 2017. Try Your Federal Taxpayer Receipt now to see where your tax dollars went.